The Artful Restroom is a new and unique public space designed to visually engage visitors with the theme of the four natural elements of earth, air, water, and fire. This permanent art installation complements the creativeness of Wheelhouse Studios and promotes the philosophy that art can enliven, enrich, and inform every facet of our everyday lives. By visiting and resting in an environment such as this, there is the hope that you will be inspired to explore the genius of nature, and that you will gain from 3.8 billion years of our ancestors’ genetic wisdom to achieve a sense of placemaking, connectedness, interdependence, and higher consciousness that you then will share with other organisms on this special planet. Fire was ignited by lightning “striking” the fire alarm to the left of the door. Then the fire spread to the mosaics to the left of the tree trunk, displaying the colors found in the seasonal burning of the prairies. The glazes on these mosaics range from green-yellow-brown to red-yellow-brown to the scorched dark brown that turns to smoke and then a dark sky, with smoky clouds. The burning of tall grass prairies and oak savannas, whether being ignited naturally or intentionally, is a natural renewal process that enables certain indigenous plant species and creatures to thrive. The tree in the Artful Restroom is a Quercus Macrocarpa (Bur Oak) tree. These are special trees, and we can learn from the genetic wisdom of these ancestors. Some bur oaks are marker trees showing the pathways to fresh water resources and other important places. They also have a tap root that goes deep into the earth, as well as roots closer to the surface. The roots at the surface feed smaller plants by releasing water with nutrients during dry spells. Since bur oaks are shade intolerant, they benefit from fires that eliminate other deciduous trees that could overtop them. The thick bark of mature bur oak trees insulates their cambium from high temperatures, so that after 12 to 15 years they can survive repeat burning with little or no damage. They are also drought and disease resistant. Learn to recognize the rounded lobes of their leaves and their large mossy acorns, which are an important source of food for wildlife. These trees give a sense of place as to where this space is located on the University of Wisconsin-Madison campus. There are large bur oak trees on the Memorial Union terrace, and there is a bur oak savanna restoration project along Lakeshore Path. Even though you will find a number of these majestic Bur Oak trees with branches reaching out and limbs spreading in Madison and on the UW campus, for them to continue to persist, preservation and restoration of natural environments that existed centuries ago is needed. The curved custom handcrafted cobalt blue glass pieces represent flowing water. 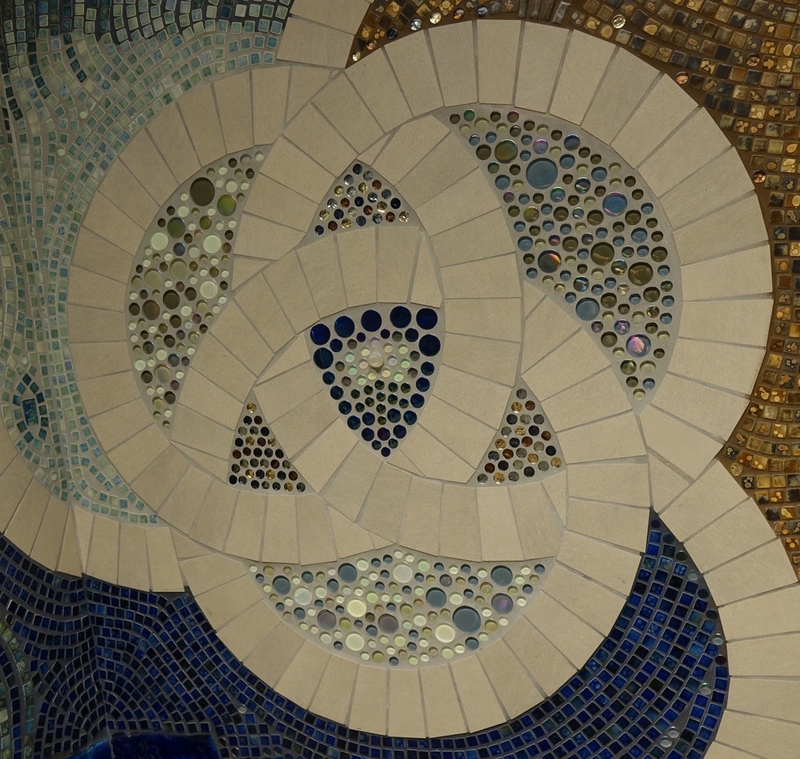 They are connected by the small mosaic tiles to show the direction of the flow, and how water is the element that unifies all life. With the Memorial Union terrace location on Lake Mendota, water is also a placemaker. Wisconsin has over 330 watersheds and 32 basins. It is important to learn how to respect, restore, monitor, and maintain our natural water resources. The tiles depicting sea creatures represent the shell fossils that can be found in the layers of earth under the Four Lakes area surrounding Madison’s isthmus. The sedimentary rock strata under Picnic Point and along Lakeshore Path provide evidence of a long-lost subtropical sea that existed in the Wisconsin environment of 480-500 million years ago. The three circles joined together represent sustainability. There are custom designed blends of glass dots that show the interdependence between air and earth, earth and water, and water and air. The crystal in the center of the knot represents the achievement of higher consciousness. The gray tile lines that make up the circles and continue on as the thread of the knot, turning corners and flowing into the floor, may represent an invisible element that exists “in between.” These are the fungi, the spirit, the ether, the qi (chi), the peace and the love that we are grateful for and that will remain after our lifetime on earth.